The familiar image of Jesus, the Good Shepherd [John 10:11-18], is a very popular one – even, it seems, in our modern, urbanized society, in which most of us are not shepherds and know next to nothing about sheep. What we do know, of course, is that the luckier sheep live to provide us with wool, while the less lucky sheep become lamb chops. That, I suspect, may be precisely Jesus’ point in using shepherd and sheep language – precisely what makes Jesus so special as a shepherd. This shepherd lays down his life for the sheep – a somewhat unexpected reversal of roles, a reversal of roles which brings about a new kind of relationship between the shepherd and his sheep. In most ancient pagan religious understandings, what above all distinguished the gods from us was the gods’ greatly envied freedom from death in contrast to our inescapable mortality. By becoming one of us himself and experiencing our human predicament by his voluntary dying, God – in Jesus – overcame this separation between God and us, and so reversed not just the traditional job descriptions of shepherd and sheep, but also the pagan idea that human beings exist, like sheep, simply to serve for the satisfaction of the gods. It turns out, in fact, that God actually takes satisfaction precisely in this reversal. This is why the Father loves me, Jesus says, because I lay down my life in order to take it up again. So an age-old separation has been overcome, and something new has happened in our world. A brand new connection has been created between God and us by the death – and resurrection – of the Good Shepherd, who accepted the limits of our mortal life in order to bring us, together with him, to something new beyond those limits. Now that’s all well and good, but didn’t it happen such a long time ago? And not much really seems to have changed in the world, has it? Easter comes and goes, year-in and year-out, and it all begins to sound routine, doesn’t it? What a claim! The sheer boldness of it – that humanity can be saved and that Jesus Christ is its one and only savior! Recognizing the boldness of that claim and taking it seriously – making it our own claim – is what Easter time is all about. Admittedly, given the inevitable limits of our attention, it takes some effort to keep up that Easter enthusiasm – to keep it from wilting along with the Eater flowers! And so we celebrate Easter for seven weeks, during which we read every day from the Acts of the Apostles – to recall the fervor of those first new Christians, who were transformed forever by the presence and power of the Risen Lord, experienced in the here and now in his word and sacraments. And we see how eager they were to share that experience with everyone around them – an eagerness we need to learn from, for each of us is being propelled by the power of the Easter story to trust in its power to transform the world. For, as Peter’s sermon makes clear, the universal power of Jesus’ name is not limited or constrained by any human failure to hear it. Jesus himself says he has other sheep that do not belong to this fold. These also he must lead, and they will hear his voice. The Savior of the world calls all people to his Father, as he continually transforms the world through the uniquely saving power of his death and resurrection. In Jesus, God can now be found in every aspect of human life, in places and people where one might least expect, in situations which our limited imaginations may even turn into obstacles to God’s presence. Our mission, the mission of the Church animated by the power of the Risen Christ, is to go beyond the limits of our imaginations, and become, like the otherwise ordinary people whose story is told in the Acts of the Apostles, effective witnesses to God’s saving power in our world through the death and resurrection of his Son. And we have to do this together, as his Church. We can’t be spiritual without being religious. The late Tony Judt (1948-2010) was in many ways an archetypical European intellectual, with all the baggage - positive and negative - that goes with that. All the more interesting, therefore, was his observation - in his final book (composed with Timothy Syder), Thinking the Twentieth Century (Penguin, 2012) - that "the best people to ask about what's really going on are usually not the intellectuals but the journalists" (p. 298). So perhaps it is no surprise that what I think is one of the better books recently written on the state of American religion is not by a theologian or religion scholar but by a journalist - New York Times columnist Ross Douthat, author of Bad Religion: How We Became a Nation of Heretics (Free Press, 2012). No disinterested observer himself, Douthat serves up a rigorous analysis of the contemporary American Christian landscape and offers advice to both believers and their institutions. Before he gets to analyze our contemporary "heresies," however, the first half of Douthat's book summarizes how we got to where we are today. It's a familiar story - familiar certainly to those of us old enough to have lived through it or historically aware enough to appreciate how our past was different from our present. It's the familiar story of a "Lost World" of confident, evangelizing, post-war American Christianity and its largely self-inflicted decline. Douthat's "The Lost World" examines four successful strains of post-war American Christian experience - Mainline Protestantism (personified by Reinhold Niebuhr), Evangelical Christianity (represented by Billy Graham), Roman Catholicism (exemplified by Fulton Sheen), and African-American Christianity (de-marginalized by Martin Luther King, Jr.). From there, the familiar trajectory is traced, as most major American Church groups suddenly stopped growing and entered a period of unprecedented decline (as they frantically aspired to remain relevant by accommodating to the culture they were meant to convert). Thus, even while popular interest in the things that religion had traditonally been about continued, religious institutions seemed to abandon their role - with predictable consequences for both religion and society. Douthat lauds the Evangelical-Roman Catholic rapprochement which resulted as a creative reaction to these devleopments, but also highlights the pitfalls: "all the ecumenical cooperation in the world wasn't a substitute for vigor on both sides of the Protestant-Catholic divide." Whereas "both the Protestant Mainline and the Catholic Church were strong cultures in 1950s America - capable of making their presence felt in the commanding heights of American life," today's "mainline has drifted to the sidelines of American life, Catholicism's cultural capital has been reduced by decades of civil war, and Evangelicalism still has the air of an embattled subculture rather than the confidence of an ascendent force." In the second part, Douthat discusses four "heresies" that have come to dominate contemporary American culture and America's still ostensibly Christian religion: "heresies" he calls "Lost in the Gospels" (a fashion for finding a "real" Jesus prior to and apart from the historical Church), "Pray and Grow Rich" (an uncritical reconciliation of Christianity with prosperity), "the God Within" (a pyschologized, self-absorbed religiosity, what Philip Rieff famously warned against in his 1966 classic, The Triumph of the Therapeutic), and finally "The City on the Hill" (our contemporary - on both sides - uncritical reduction of religion to political ideology). What all these "heresies" have in common - the goal of all heresies, according to Douthat - is "to extract from the tensions of the gospel narratives a more consistent, streamlined, and noncontradictory Jesus," in contrast to Christian orthodoxy's "fidelity to the whole of Jesus." Douthat identifies "four potential touchstones for a recovery of Christianity, each of which has both possibilities and limitations. The four are "the postmodern opportunity" (the possibility of confronting globalized rootlessness, widespread skepticism, and religious relativism as the Church has successfully confronted such forces in its past), "the Benedict option" (a limited withdrawal from engagement with the world on the model of St. Benedict's monastic response to the Roman Empire's collapse), "the New Chrsitendom" (the growth of Third World Christianity and its impact on the American Church through immigration and missionary activity), and, finally, "an age of diminished expectations" (a crisis-induced reassessment "that's willing to reckon with the ways that bad theology and bad religion have helped bring us to our present pass"). Douthat concludes with an exhortation to the kind of individual and communal faith that can animate what he calls "a Christian renaissance." The first is a faith that is "political without being partisan," which frees Christians to embrace different political positions, while being open to the Gospel's challenge to every ideology. He recalls how not that long ago "America's leading Evangelical politician was the antiwar environmentalist Republican Mark Hatfield, and one of its leading Catholic officeholders was the pro-life Democrat Sargent Shriver. Secondly, "a renewed Christianity should be ecumenical but also confessional" and offers Timothy Keller (The Reason for God, 2008) as a model. Thirdly, "a renewed Christianity should be moralistic but also holisitic." By this he means not downplaying Christianity's moral demands in the area of sexuality but also not acting as if there were only one, rather than seven, deadly sins - and not exclusively emphasizing "minority" cases (e.g., homosexuality) while neglecting, for example, "the heterosexual divorce rate, the heterosexual retreat from marriage, and the heterosexual out-of-wedlock birthrate." Finally, Douthat insists, "a renewed Christianity should be oriented toward sanctity and beauty." He concludes: "Only sanctity can justify Christianity's existence; only sanctity can make the case for faith; only sanctity, or the hope thereof, can ultimately redeem the world. ... To make any difference in our common life, Christianity must be lived - not as a means to social cohesion or national renewal, but as an end unto itself." Today is "Cuckoo Day" - an old English observance marking the migrating birds' return from further south. Since the Evangelist St. Mark has for centuries also been commemorated on this day, the cuckoo became a symbol of St. Mark (along with the more familiar - and much more majestic - lion). Farther south (where presumably the birds had long since returned) a dog was sacrificed on April 25 as part of the ancient Roman Robigalia festival, focused on protecting the spring and summer crops from mildew. One of ancient Rome's several spring agricultiral festivals, Robigalia featured major (4 horses) and minor (2 horses) chariot races. With triumph of Christianity these races were transformed into the Rogation Procession - the "Greater Litanies," as they came to be known. Ancient peoples appreciated their dependence on the natural seasons and the harvest. The change in religion redirected the focuus of people's prayers to the true Creator God. But that didn't change their dependence on nature or their need for a successful harvest or the value of ritualizing that on traditonal days. For centuries, the "greater Litanies" were faithfully observed on April 25 (along with the "Lesser Litanies" on the Monday, Tuesday, and Wednesday before Ascension Thursday), until abolished by Paul VI. We hear a lot today - and rightly so - about climate change and its devastating effects. Perhaps a rationalized late 20th-century Roman Liturgy's abandonment of such reminders of our connection - and dependence - on nature wasn't such a smart idea, after all. I have just finished reading Geoffrey Kabaservice’s Rule and Ruin: the Downfall of Moderation and the Destruction of the Republican Party: From Eisenhower to the Tea Party (Oxford University Press, 2012). Its strongly worded - indeed polemical – title tells us where the author comes down in his evaluation of that history. It is, however, a very good history of the modern Republican Party and – by extension at least – of American party politics in the half-century plus since World War II, with particular emphasis on the earlier period. That, of course, is the era my Boomer generation so well remembers and – more than just remembers – the era so many of us were fundamentally formed in. Dividing time into decades is artificial, of course; but it works. So I would divide that period into the peaceful and prosperous decade of the 1950s, followed by the tumultuous and exciting but ultimately catastrophic 1960s, leading directly to the onset of national decline in the 1970s. (That decline would go into apparent remission somewhat in the 1980s and 1990s but then become almost inexorable in the first decade of the 21st century). From the way Kabaservice tells the story, Moderate Republicanism’s fate fairly parallels that larger trajectory of American political time. The development of the Conservative Movement in the 1950s as a reaction against Eisenhower, its subsequent takeover of the Republican Party with Goldwater in 1964, and the movement’s various new waves in each of the subsequent decades is a familiar story and one which has been often told. However, I don’t know of any telling of it that has been so focused and in such detail on the corresponding collapse of what had previously been the moderate Republican mainstream. Given that, as recently as when I studied American Politics in graduate school in the 1970s, it was still taken for granted that American political parties were inevitably more or less broadly-based coalitions, the novelty of the current situation (in both parties) cannot be overstated. In the past 60 years, the US has had three successful Republican Presidents – Eisenhower, Nixon, and Reagan. (By contrast, I would venture to say, there has been only one comparably successful Democrat – Bill Clinton). Eisenhower and Nixon – and even, but to a much lesser extent, Reagan – governed moderately. Kabaservice emphasizes that the merit of Moderate Republicanism wasn’t just facilitating compromise (which is what it sometimes tends to get reduced to when its absence is lamented today) but real programmatic political substance. in Indeed, one of the merits of this book is to highlight the important part played by Moderate Republicans in advancing much of what we retrospectively see as a progressive agenda – especially in the area of Civil Rights. In 1972, the New York Times acknowledged that Nixon’s centrist administration had “narrowed the gap between the two major parties.” At the same time, what Kabaservice calls “Nixon’s rhetorical conservatism, his willingness to polarize the country around controversial social issues” had a long-term contrary effect. The story, of course, is much more complicated than that and Kabaservice’s book deserves a full and careful reading. One area where I think the author's analysis deserves further development, however, is precisely that of impact of our growing social-cultural-moral divide. Those “controversial social issues” of the late 1960s and early 1970s were serious and divisive, but not nearly so as the subsequent complete breakdown of any possibility of some kind of fundamental moral social consensus in the aftermath of Roe v. Wade, after which political (and religious) polarization escalated to levels that are not only very high but from which it is hard to imagine either side ever retreating. According to tradition, the city of Rome was founded on this date, April 21, in the year 753 BC, by twin brothers, Romulus and Remus, whose father was Mars, the god of war. According to one version of the legend, the twins were abandoned in a basket on the banks of the Tiber whereupon Tiberinus, the river god, made the basket catch in the roots of a fig tree that grew in the Velabrum swamp at the base of the Palatine Hill. The twins were found and nursed by a she-wolf and fed by a woodpecker, until a shepherd named Faustulus discovered them and took them home, where he and his wife Acca Larentia raised them as their own children. (The ancient Velabrum district is now the site of a venerable Roman church dedicated to the martyr St. George, S. Giorgio in Velabro, the station church for the Thursday after Ash Wednesday). As adults, the two are supposed to have argued about which hill to build on – Romulus preferring the Palatine and Remus the Aventine. When Romulus began building his city wall on his hill, Remus ridiculed his brother’s work and then ominously jumped over the wall, belittling his brother’s accomplishment. I had always been taught that this was an act of brotherly spite, suggesting the weakness and perhaps the indefensibility of Romulus' Palatine city, and that Romulus accordingly killed his brother out of injured pride. In my Causes of Saints class in Rome this past winter, however, I learned that Remus' action also constituted a sacrilege, in that the walls delimited the sacred space of the new city, separating the sacred from the profane. The two interpretations reinforce rather than contradict each other, but the second one amplifies the event's significance in the context of a pre-modern sacral society. In any case, Romulus responded by killing his brother - thus determining the new city’s name! In time, of course, Rome would become the greatest city in the world, the capital of the greatest empire the world had ever yet known. According to legend, Romulus ascended to heaven in a storm and became a god. Soon after, according to the Roman historian Livy, he supposedly appeared to a prominent roman and said: "Go, and tell the Romans that by heaven's will my Rome shall be the capital of the world. Let them learn to be soldiers. Let them know and teach their children that no power on earth can stand against Roman arms." (Even ib ancient times, it was widely believed that Rome's first king had actually been murdered by the aristocratic Senate, and that his divinization was a clever cover-up to appease the common people). To that same city, some 8 centuries later, came two men, Peter and Paul, brothers not by blood, but by their common faith in Jesus Christ, who had called them to be apostles. The Christian community they found in Rome was small, socially and politically insignificant - an easy target when the Emperor Nero needed scapegoats to blame for a destructive fire in the year A.D. 64. Among those who gave their lives as witnesses to the Christian faith in that initial Roman persecution of the Church were the apostles Peter and Paul. The old Rome, founded on this date – powerful pagan Rome, founded on the murder of one brother by another - was, for all its grandeur and admittedly great accomplishments, still just a human city like any other, a warring conqueror city to be conquered in turn by other warring conquerors. 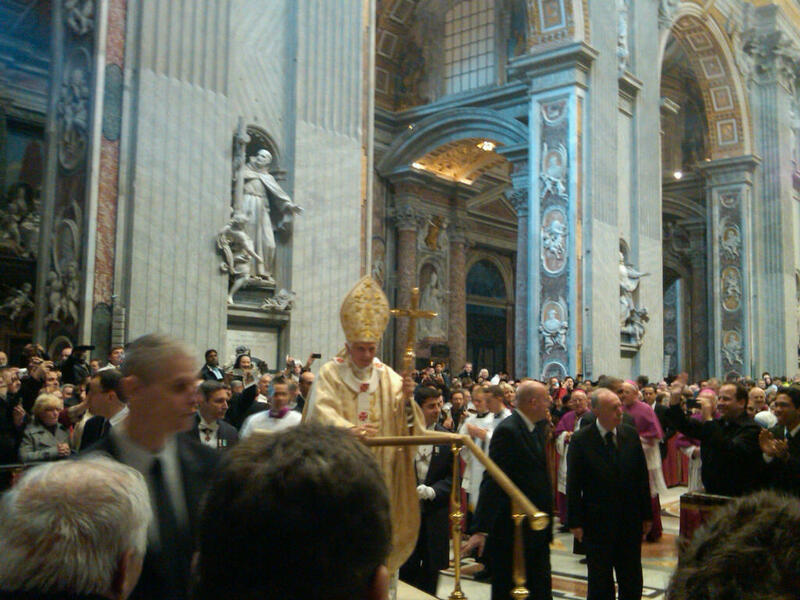 The new Christian Rome of Peter and Paul ultimately conquered the old Rome, but in a new way. The powerful pagan Rome, founded on the murder of one brother by another, was itself conquered by the faith that empowered the brothers-in-Christ to die together as witnesses to a new and better way of life. As a political maneuver, it certainly made sense for the Romney forces to deflect what was essentially a class reference to Mrs. Romney’s economically privileged position in comparison with that of most women and turn it into a debate about whether and how we should value motherhood. Similarly, it made sense for the Obama Campaign to react immediately to preserve its own commanding lead among higher status women (the infamous “gender gap”). The fact that it makes political sense to take this silly stuff so seriously guarantees, of course, that there will only be more of it. Family issues really are important, of course. Strong and stable families effectively socialize the next generation in ways that are important morally, culturally, socially, and economically. How we define and support (or don’t support) strong and stable family structures is a legitimate subject for political discussion and debate – serious, rational debate of the sort we have very little of and which our morbid delight in constantly taking offense guarantees we’ll have even less of – precisely when we may be needing it the most. Seven years ago this week, on April 19, 2005, Joseph Cardinal Ratzinger (who turned 85 just yesterday) was elected Pope and took the name Benedict XVI. 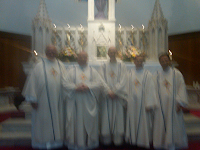 I was Parochial Vicar at St. Paul the Apostle Parish in New York at the time. The previous day during a conversation about possible papal names, my then pastor had asked me what name I would choose if I were elected. Recalling the half-donze or so names chosen by modern popes, I settled on Benedict XVI - partly because it was the most recent name chosen by a pope prior to my lifetime and partly because I admired Pope Benedict XV (who reigned from 1914 to 1922) especially for his efforts to end World War I in a way which would have left the pre-war world largely intact. A day later, my intellectual appreciation of the conclave's choice was personallyheightened by my emotional appreciation of his choice of name! The choice of name may say something about a particular pope's personality and piety and may possible even hint at his priotities and plans for his pontificate. It is sometimes suggested that this Pope's choice of name reflects his appreciation of the great St. Benedict (c.480-547) and a concern for the re-evangelizaiton of Europe (whose patron St. Benedict is) - certainly a most worthy priority and a natural one for a great European intellectual who is in so many ways a product precisely of that classical Catholic European culture that is tragically fast disappearing. Certainly, one of the especially attractive things about Pope Benedict is how obviously a product he is of the Catholic culture of his native Bavaria - in his formative years (and probably still now) the most Catholic and conservative part of Germany. This is all the more noteworthy in view of the popular prejudice that embracing an intellectual vocation necessarily distances one from the piety in which one was formed. If nothing else, Joseph Ratzinger's life story illustrates how the two - a traditonal Catholic spirituality and a profound commitment to an intellectual life - not only can be reconciled but can actually reinforce one another in the most supportive and positive manner. Both as Joseph Ratzinger and as Supreme Pontiff, Pope Benedict's lifelong theological work represents a major contribution to the present and future life of the Church. Still, it is relatively rare for a first-class theologican to sit in Peter's chair. Even back when most bishops were expected to be theologians, they were also expected to excel at other things too. For all the brilliance he brings to the papal office, the Pope is first and foremost a Bishop - the pastor "Urbi et Orbi" of God's people, whose ministry includes modelling pastoring for the rest of us. Personally, I suspect that his greatest single contribution - so especially significant in today's self-absorbed culture of performance and celebrity - may be the self-effacinn reverence with which he celebrates Mass and which he has sought to re-introduce into papal events, inviting by example all of us to focus less on ourselves and more on what we are doing and why and how. The combination of age, my vocation, and personal preference have more or less disconnected me from much of what passes for "popular culture." I had never even heard of The Hunger Games until, last month and just back from Rome, I overheard someone talking about the book (and the forthcoming movie), while I was sitting in the Madison Avenue Atrium, drinking a Starbucks Chai Latte while waiting for my niece's High School Band to perform. But, having since finished Holy Week and Easter and undergone a tooth extraction, today seemed to me to be a good time at last to take an afternoon off and engage in oen of my very few leisure pursuits - go to the movies. Unlike, say, Harry Potter, I saw the movie without reading the book. So how faithfully the film follows the book I cannot say. But, as post-modern dystopias go, the film is well worth the more than two hours attention it requires. Noteworthy, finally, for its absence from this post-modern secularist utopia is anything resembling religion. Not only is there no trace of Christianity or any other historical religion, there is no simulated, made-for-the-movies, presudo-religious pagan cult. There isn't even the kind of naturalistic superstition of the sort that - if present trends signify anything - one would expect to see lots of in a post-Christian world. The Hunger Games (the "games" themselves, not the film) are a politically contrived ritualistic spectacle, worthy of ancient Rome, but wothout the religious and cultic underpinnings that gave the comparable Roman ritualistic spectacles personal meaning and social coherence. In the early Church, those newly baptized at Easter received white baptismal robes that would be worn at Mass each day of Easter Week. The Sunday after Easter was therefore called Dominica in Albis Depositis ("Sunday in Setting Aside the White Garments"). This serves as a reminder to us all that the Easter season was originally a special season for the newly baptized, a time for them to “process” (as we might say nowadays) their Easter experience. One of the ways they did that - and the rest of the Church still does that at Easter Time - is through the daily reading of the Acts of the Apostles. Acts is a continuation of the Gospel according to Luke. It continues the story after the Risen Lord’s ascension and is Luke’s account of the experience of the apostolic Church and of its growth & expansion – an experience summed up in the title of a certain children’s book version of Acts that came out some 20 or so years ago, called Good News Travels Fast. Today’s 1st reading from the Acts of the Apostles [Acts 4:32-35] describes the life of the Christian community in Jerusalem. Of all the things that might have been mentioned (many of which are mentioned elsewhere), 2 aspects of the life of those 1st Christians are emphasized: first, the powerful witness of the apostles to the reality of the resurrection, and, second, the dramatic transformation in people’s behavior that resulted from that and then in turn became itself a powerful form of witness. The prominence of the apostles in this account reflects their prominence in the early Church, not only as those chosen by Jesus to be among his closest companions during his lifetime but also as those designated by the Risen Christ to be witnesses that the same Jesus who had lived and died was now risen from the dead and to proclaim this message to the entire world. The power of that witness was demonstrated for all the world to see not only in the exciting and miraculous deeds done by and among the 1st Christians but also - and especially – by their way of life. In a world torn by conflict and division, the community of believers strove to be of one heart and mind. In a world divided between rich and poor, between “haves” and “have nots,” no one claimed that any of his possessions was his own, but they had everything in common. As the successors of the apostles, the bishops of the Church represent our link back across time to the Apostolic Church, of whose faith we are the inheritors and of whose witness we are the beneficiaries. As successors of the apostolic college and members of the world-wide College of Bishops, the bishops of the Church also represent our link – one local church to another – uniting us across space as well as time with believers of every race, language, nation, and way of life. The world in which we live seems overall to be much more characterized by doubt and cynicism than by faith and hope. All the more necessary, then, is the living witness of the Church to the presence of the Risen Christ in our midst and his continued action in the world through his Body, the Church. In the world in which we now live, it is division – not unity – that remains fundamental to the human condition. Social, economic, ethnic, linguistic, national, and generational divisions form the structural fabric of human relations. All the more necessary, then, is the living witness of the Church to a new order of relationships linking people and communities of every race, language, nation, and way of life – challenging us all, individually and collectively, to live as changed people because of the presence of the Risen Christ in our midst, as witnessed by his continued action in the world through his Body, the Church. It was an easy question to answer. I mentioned the ancient Christian custom of the newly baptized attending Mass still dressed in their white baptismal robes for an entire week until the Sunday after Easter, and how the whole week was seen as a continuation of their Easter experience – a explanation that, while it may have effectively reduced the octave liturgy to a vestigial historical curiosity (perhaps like the Roman station Masses for these days), at least minimally seemed to answer the question. Of course, if I had been asked the same question a few months back, i.e., during Christmas week, I couldn’t have given quite such a simple answer. Perhaps, then, I might have delved deeper into liturgical history and explained how the Dedications of Churches were once celebrated for 8 days in imitation of the Jerusalem Temple’s 8-day Dedication Feast and how that then spread to other major festivals – with the result that by the mid-20th-century there were some 20 or more octaves of greater or lesser solemnity in the Roman Calendar (radically reduced to 3 in 1955 and then to only 2 in 1969). Perhaps it is just as well that the question didn’t come up back then! But then the obvious dissonance between the ubiquity of octaves for much of liturgical history and the post-modern problem of appreciating the essentially mystagogical character of an octave got me thinking. It also reminded me of a seminary classmate who once agued that the Easter season was simply too long (at 7 weeks) to be sustained by contemporary people and advocated its reduction to one week at most. He did have a point (sort of), as indeed did the questioner perplexed by octaves! Indeed, does the radical reduction of octaves in the recent reforms reflect a realistic accommodation of sorts to this cultural change? Why is it that ancient and medieval people could celebrate a festival for 8 days (or even more)? What have we done to time and to the way we live time that has rendered such extended celebrations incompatible with contemporary life? We seem to do better at anticipation. The commercial motive may explain some of that – the long Christmas season that begins earlier and earlier all the time but promptly ends on December 25, and the similar, if less pervasive, commercial build-up for Valentine’s Day, Mother’s Day, etc. Commerce aside, however, even in Church we do better at anticipation. Admittedly Advent doesn’t work so well in our society – so overwhelmed is it by the anticipation of Christmas. Lent, however, works very well, and is probably the most actively and widely observed season of the liturgical year – perhaps the only season to be in fact observed as such, since even in Churches there seems to be a somewhat precipitous drop-off in activity in the immediate aftermath of both Christmas and Easter. I love Lent, and I think it is wonderful how parish life intensifies during that time, and I recognize that one cannot remain always at such a high level of intensity. Still, the question deserves to be asked: Why is the level of interest Lent generates so largely unsustainable during Easter Time? The US Conference of Catholic Bishops' Ad Hoc Committee for Religious Liberty has issued what can fairly be called a call to arms in the emerging battle for the future of religious liberty in the United States ("Our First, Most Cherished Liberty: A Statement on Religious Liberty"). How much attention it will actually get beyond narrowly clerical circles is anyone's guess at present, but the issue is obviously not going to go away, and the Bishops have a done an excellent job of stating their case clearly and highlighting what is ultimately at stake. For, while the threat is external, in the culture, its efficacy derives from religion's perceived political weakness. To cite the familiar example of the HHS Mandate, what government would ever have created such an unnecessary conflict if there had been reason to believe that the religious institutions under attack could successfully mobilize politically to oppose it, i.e., that they could count on the necessary numbers of voters to support religious liberty against the government? Invoking Pope Benedict's Ad Limina Address to American Bishops in Rome last January, the Bishops recognize the fundamental challenge: "the need for an engaged, articulate and well-formed Catholic laity endowed with a strong critical sense vis-a-vis the dominant culture and with the courage to counter a reductive secularism which would delegitimize the Church's participation in public debate about the issues which are determining the future of American society." (I am reminded of Isaac Hecker's understanding that an effective outward-oriented Catholic evangelizing mission in American society presupposed an internal renewal of the Church's energies). The litany of external threats repeated in the Bishops' statement highlights how pervasive the challenge to religion has become - a challenge that did not just begin with the HHS Mandate. In addition to that, the Bishops call attention to several recently passed state immigration law that criminalize the pastoral care of undocumented immigrants, a poposed 2009 bill in Connecticut to force Catholic parishes to restructure their governance in a non-Catholic manner, a State University Law School denying student organization status to a Christian Legal Society, Catholic Charities being driven out of adoption and foster care services in certain jurisdictions, New York City's barring churches from renting public school space on the same terms as other, non-religious groups, and the recent federal government discrimination against Catholic humanitarian services. Notwithstanding that freedom of religion is enshrined in the Bill of Rights - in the very first sentence of the First Amendment - it is easily undermined when insufficiently valued by society. By dramatically demonstrating just what is at stake, perhaps the controversy caused by the HHS Mandate has done us all a favor. 100 years ago today, having picked up its last set of passengers at Queenstown, White Star Liner RMS Titanic left the Irish coast behind and headed out into the open Atlantic bound for New York. It never got there, as we all know so well. In Belfast where it was built, in Southampton its home port from which so many of its crew came, and no doubt in many other places as well, the centennial of the Titanic's tragic voyage is being recalled. And,of course, the 1997 romantic disaster film based on the tragedy has been re-released, and is playing right now in IMAX-3D in downtown Knoxville. 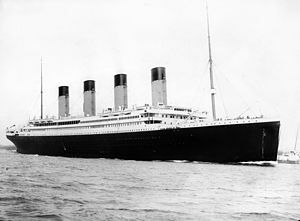 In its short life, the Titanic was an object of great popular fascination - exceeded ever since by our apparently insatiable fascination with everything about the ship and its sinking. Tragic accidents always interest, but when the subject is already fascinating in itself - the Titanic, the Hindenburg - the popular impression created by the event seems multiplied. The Titanic tragedy takes us back to another world - the Edwardian Era, with which my generation became particularly familiar in the 1970s thanks to Masterpiece Theater's Upstairs, Downstairs. (King Edward VII, from whom that "era" receives it name, actually died in 1910, but by common convention the "era" effectively extended until it was tragically extinguished in 1914 with the guns of World War I). The Edwardian Era was both the best and worst of times - a world vastly superior to ours in dignity, values, and manners, but also a much harsher, insecure, and inequitable world, which most of us woud be reluctant to return to. The fabled images of the Edwardian luxury liner and the stories of its passengers and crew - especially the rich and famous who were lost (or, occasionally, as with the "Unsinkable" Molly Brown, survived) continue to hold our interest even after 100 years. So do the accounts of genuine heroism and devotion to duty on the part of the crew (and others, among them three priests). Obviously, there are features to the story that transcend its time and circumstances sufficiently to speak in seemingly universal terms. The same is true of the lessons of the disaster. Driving too fast is as bad an idea now as it was when the Titanic sped through the icy waters of the North Atlantic. Safety considerations often rank less than economic and other concerns, and that too is a bad idea, now as when the great luxury liner carried insufficient lifeboats to accomodate all its passengers. The list could go on. The Titanic fascinated Edwardians then and fascinates us still because of its ambition. It was huge - one of the largest human-made objects in the world at the time. Size matters, to coin a phrase. More to the point, size speaks. It signifies. It expresses human hopes and dreams, the ambition to do what has never yet been done or go where no one has ever yet gone, etc. Where would the human race be without ambition? Certainly a lot poorer and less accomplished! Like the Roman god Janus - or like any ordinary coin - ambition has two sides. The other side is hubris. In testing limits, in pushing the envelope (to use a less attractive modern image), we are forever in danger of pushing too far. The (perhaps apocryphal) saying that "God himself could not sink the Titanic" was proven wrong - not by direct divine intervention but by the predictable consequence of banging up against an iceberg. The image of the largest ship afloat, sunk in a little over two hours, by something so ordinary as ice made a real impression in that much more morally impressionable era. However morally obtuse our own era is increasingly in danger of becoming, the story of the Titanic still speaks, still impresses, still warns. Obama’s challenge will be to hold his centrist support in the country by resisting the demands of his party’s left wing and its various special interest constituencies. … Meanwhile, the significance of the religious constituency in a renewed Republican coalition will likely depend on whether or not the Democrats can deliver on the economy and stay safely in the center on cultural and moral issues. I was reminded of those utterly obvious observations yesterday, as I read Eric Alterman’s “Campaign Stops” essay, “Cultural Liberalism Is Not Enough,” in yesterday’s New York Times “Sunday Review” section - http://campaignstops.blogs.nytimes.com/2012/04/07/cultural-liberalism-is-not-enough/?scp=5&sq=Campaign%20Stops&st=cse. The destructive polarization of our society – which now extends to virtually everything – is rooted in a radical destabilization of culture and an undermining of moral order that has been going on for decades now – at least since Roe v. Wade (1973), if not before. Jurisprudentially, after all, it was the Supreme Court’s invention of a supposed constitutional “right to privacy” in Griswold v. Connecticut (1965) which paved the way for Roe v. Wade. Certainly the process predates Roe and extends beyond the single specific problematic of abortion – although one should never underestimate the galvanizing power of that one destructive decision in creating the largely unbridgeable chasms that increasingly define our society and are getting in the way of our ability to resolve any problems at all. There is, after all, no necessary or logical link between resisting the secularization of America and, for example, rejecting the science of climate change or supporting tax breaks for the super-rich. In a system, however, in which competing elites create such linkages, citizens increasingly have to choose between complete ideological packages. Such is the human desire for coherence that undoubtedly many – on both sides – probably come to believe intensely in such unrelated positions! It was not completely unreasonable to hope in 2008 that political calculation would steer the Obama Administration in a more moderate direction. He was elected, after all, as a consequence of the greatest economic crisis since the 1930s - a crisis which should have exploded and thoroughly delegitimized reigning economic orthodoxy, much as the Great Depression had earlier done in another crisis for another generation. The Administration’s stated intention during the health insurance reform debate, that the reform should be “abortion neutral,” for example, further held out the promise of moderation. What went wrong? Rarely does one single explanation suffice, and this issue is no exception. But I do think that one cannot underestimate the problematic of post-modern moral obtuseness. Bill Clinton, to cite an obvious contrast, was a more successful President in part because he is a more natural politician when it comes to connecting with ordinary people. But he is also older – coming from the beginning, rather than the end, of the Baby Boom – and was personally a participant in what we recall as the 60s. People from Clinton’s era may embrace the values agenda of “cultural liberalism,” but they do so with their eyes wide open. They know that many others don’t – and won’t - agree. And they even understand why others don’t agree. And they can actually appreciate the fundamental moral and social issues at stake. And finally they can recognize what is being lost, as well as what may be gained, when elites push a society to change its values. Whatever the President’s own personal take on all of this, the constituencies to which his Administration seems most responsive increasingly do not. It happened early in the morning on the first day of the week [John 20:1]. Every morning is, in a sense, a new beginning, a chance to start over, In the normal course of events, however, the Sabbath day of rest would have been followed in the morning on the first day of the week by business as usual – both for the living, who would go back to their regular daily work, and even more so for the dead, decaying in their graves, who (then as snow) were expected to stay dead. Presumably, those who went to visit Jesus’ tomb early in the morning on the first day of the week also shared those same general expectations. John’s Gospel mentions Mary Magdalene only and just says that she came to the tomb early in the morning. The other Gospel writers, however, tell us that Mary was accompanied other women, and that their purpose in visiting the tomb was to anoint Jesus’ body. However many they were and whatever they expected to do, it seems safe to suggest that their expectations that morning were well within the range of the normal. Jesus’ resurrection was a historical event of the most monumental importance – more important even than our travelling roadshow of presidential primaries – the most important event in all of human history. And yet, however hard it may be for us to imagine (in this age of omnipresent media and the 24-hour news cycle), the resurrection was hardly even noticed at first. It is the resurrection’s long-term effects which we actually experience and which bring us here today – as Jesus’ body that lived and died and still forever bears the marks of his passion emerges from the tomb to transform our world, starting right here and now with us. Even so, as we just heard, the first few to be made aware of this momentous news left the empty tomb more confused than elated: For they did not yet understand the Scripture that he had to rise from the dead [John 20:9.. In a world which seems permanently stuck in the dark, pre-dawn position, where death always seems to have the final say, the disciples needed to experience the kind of change that could only come from the Risen Lord’s living presence among them. And so do we, which is why we are here, where the Risen Lord brings us together as no one else can. So, instead of the 1st day of the week condemning the world back to business as usual, this 1st day after the Sabbath is starting something new – not just a new week, but a new world, where death no longer has the final say. And we are here, in this holy place today, because God did not stop for good on the 7th day, because there is now a new day, on which God has, so to speak, re-created the world in his Son, Jesus Christ, crucified, dead, and buried, but now risen from the dead. That new day is today – and every day from now on, until we too will appear with him in glory [Colossians 3:4]. That is why we have to come back, Sunday after Sunday, to be filled in on what happened next and thus experience the effects of the resurrection ourselves. Like the disciples in the Gospel, some of us run fast. Others, beset perhaps by doubts or daily difficulties, run much more slowly. What matters most, however, is where we finally end up. So whether we are runners or walkers, we must accompany the disciples to the tomb, which in a business-as-usual world would have remained dark, but from which the stone has been removed – so we can see and believe. Easter invites us put ourselves in the position of the disciples – and allow ourselves to experience something wonderfully and completely new in a world which seems so ordinary and old. Easter invites us to start living in the present that new and different future to which the Risen Lord is leading us. Homily for Easter Sunday, Immaculate Conception Church, Knoxville, TN, April 8, 2012. This is the night, when once you led our forefathers, Israel’s children, from slavery in Egypt and made them pass dry-shod through the Red Sea. So sang our deacon a short while ago in the stirring words of the ancient Praeconium Paschale, more commonly called the Exsultet (its opening word in the Latin original). As a deacon myself back in 1987, I prepared myself to sing the Exsultet by listening to a recording of it every day of Lent, listening and repeating it until I somehow had every note and every up-and-down of the melody memorized so as to fulfill that challenging chore to – as the celebrant says to the deacon when blessing him beforehand – proclaim his paschal praise worthily and well. Both in its antiquity and in its solemnity, the Exsultet testifies in sublimely beautiful language to the specialness of this sacred night, the Passover feast - the night when once God led our forefathers, Israel’s children, from slavery in Egypt and made them pass dry-shod through the Red Sea – fulfilled for all and forever in this night when Christ broke the prison-bars of death and rose victorious from the underworld. In the centuries-old ritual for the Passover seder, it is said that “in every generation” every person should view him or herself as having personally come out of Egypt. Passover isn’t just some historical anniversary. It is something that happens in the lives of God’s People here and now. And so this Passover feast of the Church, as the Exsultet tells us, is the night that even now, throughout the world, sets Christian believers apart from worldly vices and from the gloom of sin, leading them to grace and joining them to his holy ones. And so, in times past, the faithful of Rome assembled at nightfall at the Basilica of St. John in the Lateran, the Mother Church of both the City and the world, for an all-night vigil, while next-door in the Baptistery the newest members of the Church, solemnly renouncing Satan and all his works and empty show, passed through the saving waters of baptism, an experience meant to be every bit as transformative for them as passing through the Red Sea was for the Israelites. The Exsultet expresses how they undoubtedly would have experienced their emergence from that Baptistery in the dawning light of Easter morning: The night shall be as bright as day, dazzling is the night for me, and full of gladness. And so it must be for all of us. Whether we are being baptized or confirmed tonight or were baptized and confirmed many decades ago. As at a seder, so on this most holy Passover night, we must each of us experience coming out of Egypt. As the Church, on this most holy Easter night, we must each of us experience Christ breaking the prison-bars of death and rising victorious from the underworld. As his Church, on this most holy Easter night, we must each of us solemnly renounce Satan and all his works and empty show. Then, indeed, this night shall be as bright as day, dazzling and full of gladness. "Is the alternative in pastoral ministry rigorism or laxism? Everything goes - or nothing goes?" That was how Christoph Cardinal Schoenborn framed the question in his Chrism Mass homily in vienna's historic St. Stephen's Cathedral this past Monday. Lest he be thought - eminent scholar that he is - to be speaking about the challenges of pastoral ministry in an abstract way detached from those neuralgic situations we increasingly encounter in Western societies, situations in which "the order of creation and its binding interpretation by Jesus himself" seem increasingly incomprehensible to more and more people in a world which seems to suffer from a "lack of awareness of the need for salvation," Schoenborn specifically cites three such situations in his homily. Anyone actively involved in pastoring readi;y recognizes the reality to which Vienna's aristocratic Archbishop refers. Where some respond with rigorism, others appear dangerously lax. At a Chrism Mass, a bishop gets to speak directly to his priests. So the Cardinal pointedly asked: "Are we ourselves, the shepherds, or in other words, is everyone of us convinced that this Biblical perspective is the true perspective, not some distant, abstract ideal but something magnificent, life-affirming, life-giving? If we ourselves regard all of this as an illusion, then we can't help others to 'come to know the truth'." (It was just this challenge that motivated my 2005 study project at St. George's House, Windsor Castle. Building on an idea from a contemporary Jesuit moral theologian [James T. Bretzke, A Morally complex World: engaging Contemporary Moral Theology, The Liturgical Press, 2004], I considered the increasingly widespread contemporary reality of a kind of "cultural invincible ignorance" to examine what range of responses might be beneficial in such circumstances). I've attended numerous Chrism Masses over the years and heard and read lots of homilies composed for that occasion. these two are undoubtedly among the very best - a fitting introduction to the upcoming "Year of Faith." These three themes have historically characterized this day – with different emphases at different times. In the ancient Roman titular churches, the reconciliation of those doing public penance took place at an end-of-Lent morning Mass, while the institution of the Lord’s Supper was recalled at another Mass in the late afternoon. In between, the priests from all the titular churches assembled for a single mid-day Mass at the Lateran Basilica at which the Pope consecrated the sacred chrism and blessed the other holy oils. The elaborate ancient ritual for the Reconciliation of Public Penitents continued to be printed in the liturgical books up until the 1960s, even though it hadn’t been used in that form for over 1000 years. The blessing of the oils has continued uninterrupted to this very day, although the special Mass for that was only revived in the 1950s, at the same time that the Mass of the Lord’s Supper was moved to its present evening hour. 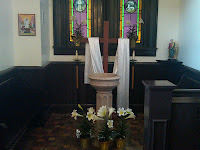 Yet, while all these ceremonies have evolved and been changed over time, those three basic elements so long connected with this day remain still very much at the heart of our Easter experience – this year and every year – and they all come together in the Eucharist we celebrate at this altar. For tonight, we don’t just remember the Last Supper of Jesus with his disciples, as some interesting thing that happened in a faraway place a long time ago. Rather we remember and celebrate the how Jesus’ special Last Supper continues now in his Church as the Lord’s Supper. St. Paul’s letters are among the oldest New Testament writings, and so his 1st letter to the Corinthians, from which we just heard, was the earliest written account of Jesus’ Last Supper with his disciples on the day before the Passover holiday. It’s safe to suggest that none of those disciples, as they sat down to supper, suspected that by the time Passover began, some 24 hours later, Jesus would be dead, and buried in a stranger’s tomb, and that they would all be in hiding. Certainly, none of them yet realized how this otherwise ordinary meal would be dramatically transformed by Jesus’ own words and actions into the Church’s central sacrament - as, offering his body and blood to his Father, Jesus would give them to his Apostles to eat and drink, and then direct them and their successors in the priesthood to offer them in turn. The New Testament tells us how, from the very beginning, Christian communities devoted themselves to the breaking of bread and prayers [Acts 2:42]. As the Church grew in size and expanded in influence, the Church’s worship, centered on the regular celebration of the Lord’s Supper as Christ’s priestly sacrifice of reconciliation, would in time transform first the Roman empire and then the ever wider world – as it must still continue to transform each and every one of us, caught up in the priestly embrace of Christ’s reconciling sacrifice. So it is only fitting that we begin the first day of our Easter celebration, the day on which we commemorate Christ’s passion and death, in this supremely priestly act of reconciliation, this Eucharistic sacrifice which sums up in itself what Christ’s death and resurrection are about and everything the Church is about. By giving his body to be eaten and his blood to be drunk, Jesus expressed the deepest truth about what he would do on the Cross. The Eucharist we celebrate tonight – and all year long - makes really present that very same body once offered on the Cross, then buried in the tomb, and now risen from the dead and seated at the right hand of the Father. The mystery of the Eucharist, which proclaims the death and resurrection of the Lord until he comes again, is at the very heart of the Church’s life. It is, as we say, the sacrament that makes the Church. In the vestibule of our church is a photograph taken last Fall at the celebration of our parish church’s 125th anniversary. When I look at that picture, side-by-side with the earlier one which was taken 125 years previously, I think of all the wonderful church activity that has gone on in this beautiful building and all the wonderful church life that, like the crowd in that picture, has spilled out from this building, beginning at this altar. As we do that, then who we are becoming here around this altar will overflow from this building and fill our world, as that congregation last autumn spilled out of this church and filled up that photo.